The caper is the edible, immature bud and fruit of a spiny shrub, indigenous to the Mediterranean. Usage of the caper dates back thousands of years. Capers are classified into six groups, based on size, with the smallest considered the most sought-after: "Non-pareil." The other sizes are surfines, caucines, capotes, fines, and grusas. 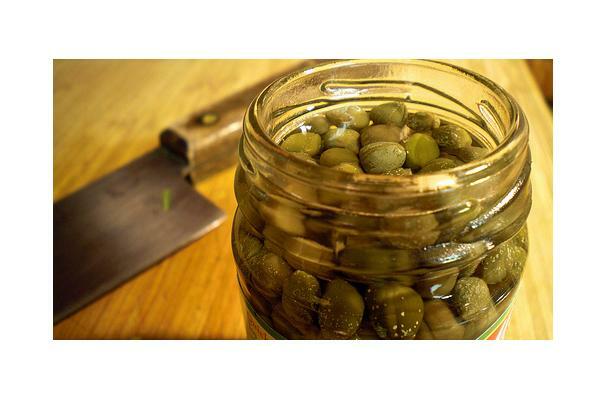 Capers are typically sold in jars pickled in salt and vinegar and have a similar flavor profile to a green olive. Some capers are only cured and stored in salt. They are a common ingredient in Italian and Sicilian cooking. They taste spicy, salty, and sour (due to the pickling) and are described as pungent. They are used in pastas, tartar sauce, salads, and lox. Capers are the unopened buds that grow on the new limbs of a caper plant. Because the plants grow wild the berries are usually hand-harvested and picked regularly in the morning hours depending on the season and when the weather is dry and sunny. Flavors: It’s a sharp, piquant, salty taste with a pungent aroma all their own. Beverage complements: Capers are also sometimes substituted for olives to garnish a martini. Buying: Usually they are found on the store shelf bottled and pickled in vinegar, oil, brine or as more rarely found capers packed in sea salt. The salted and pickled caper bud is often used as a seasoning or garnish.They are commonly used in salads, pasta salads, pizzas, meat dishes and pasta sauces.They are also often served with cold smoked salmon or cured salmon dishes. The jar should have an expiration date on it.Once opened, a jar of capers should keep in the refrigerator for about six months. Be sure to use a clean utensil each time you remove some from the jar. History: Although they are grown throughout the Mediterranean as well as parts of Africa and Asia, the finest capers are said to be the tiny nonpareille (meaning 'without peer') that come from southern France. Capers range in size from this especially small variety to much larger ones from Italy. Morocco is the largest commercial producer today.